Yes, that is correct. It is not a typo. In the art world today, this question has particular resonance. Susan Philipsz won the 2010 Turner Prize for "songs of lamentation and loss that haunt those within hearing of the sound sculptures centered on her voice." Of FreePort (No. 003) "Susan Philipsz creates sound installations that explore ways in which the emotive and psychological properties of song alter a listener's perception of place and time." 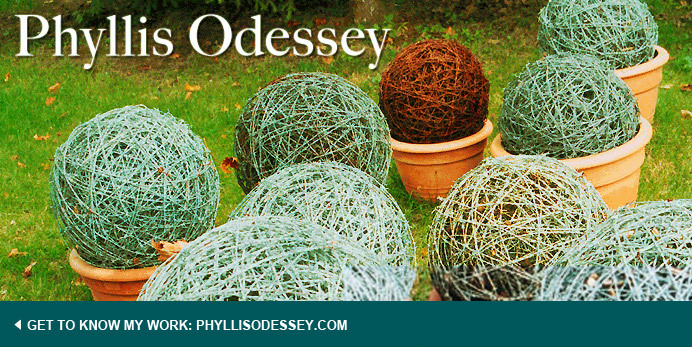 - Peabody Essex Museum website. The Turner named after the great artist, J.M.W. Turner brings sound into realm of the art prize world. 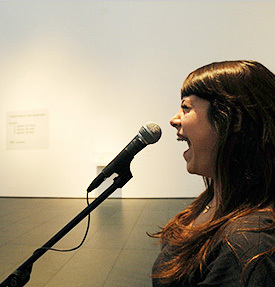 Earlier in the year, Yoko Ono gave visitors a chance to participate in her piece: From a Whisper to A Scream at MoMA. A microphone and speakers were set up in the museum's atrium, visitors were invited to scream into the mic. Some screamers felt like shareholders completing the work. The sound was heard round the museum. I couldn't get far enough a way; even the fourth floor did not shield me from the "noise." 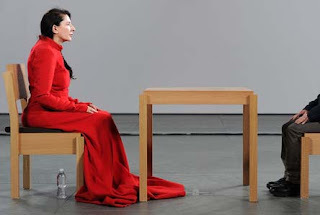 For a month visitors to MoMA could observe Marina Abramovic sitting in the atrium in total silence. Those who had the patience, waited in line to sit across the table from her and stare. This was truly the sounds of silence. This holiday season, MoMA has commissioned another sound piece. Performance 9: Allora and Calzadilla (December 8, 2010 - January 10, 2011). I went on Sunday and listened to Mia Elezovic. Again in the atrium, the center of a grand piano has a hole cut out of it, a pianist wiggles through the hole; leaning over the keyboard upside down; the performer plays the Fourth Movement of Beethoven's Ninth Symphony, "Ode to Joy." The music is transformed. The hole has caused two octaves to be removed from the piano. The tune is still recognizable, even though it sounds different. I don't remember ever being able to be so close to a pianist, except in someone's home, certainly not in a performance venue. The closeness, you follow the piano around the room as the performer moves it where they want, gives the piece a different kind of presence. You are really THERE. The concentration of the face of performer is excruciating. The audience is transfixed. Everyone has a camera. The music is superb. This is a wonderful holiday gift from the museum to its visitors. All of these sound performances raise the question: Are the visual arts dead? Has the ipod heightened our sound awareness and the computer deadened our visual acuity? Or is it simply that we crave interaction, because we live in the virtual world so much of the time? 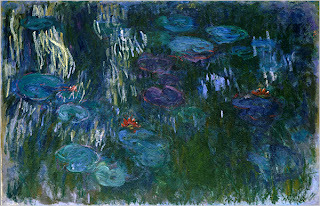 As I have done for many years, when at MoMA, I head to Monet's Water Lillies. To me this is truly the sound of joy. 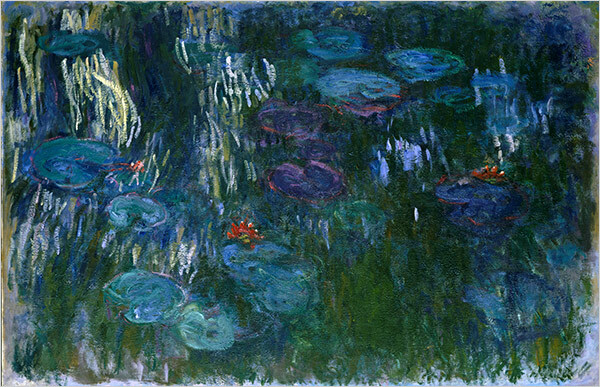 As a teenager, I used to sit before this painting and lose myself. I still do.